All the while, the strong Bull Run this week was widely expected, even here on our weekly Bitcoin price analysis. The market had been in a slump for months and exhibited weak buying resilience at reversal points. This 25 % move up in a week was on the back of consecutive upside breakouts on different price levels, suggestive signs of weakening bears and advance by bull territory. Looking at this chart we can see the trend in the past 1 and half months. A bottom hammer $275, breakouts and new 3 month high. 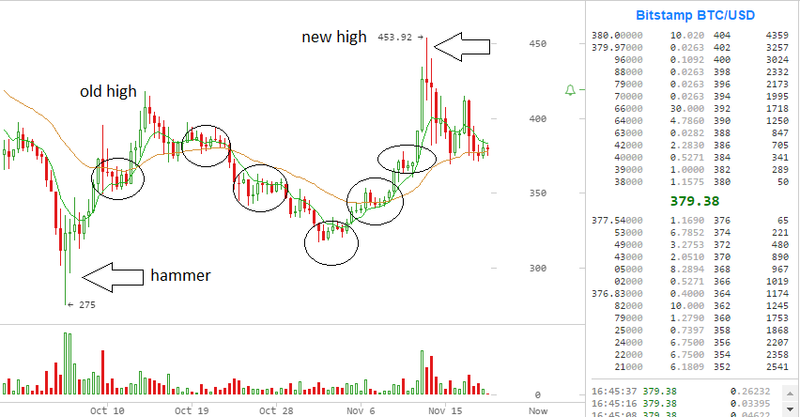 The Bitcoin market frothed as prices surged to a high of $458. Soaring prices more than doubled trading volume on all exchanges across the board. BTC China tripled in trading volume, Bitfinex almost doubling compared to last week while BTC–e had a 128% increase in volume. As part of a larger wave count, an Elliot wave ABC, a decent new high was in the play. A huge spike in volume and consecutive net buy turnovers confirmed short term bottoms (at least) in $275 and $316 were in and a valid wave count. “Yesterday at 12:15 all the exchanges were flooded by heavy selling pressure with over $ 4,699,000 worth of BTC getting dumped. 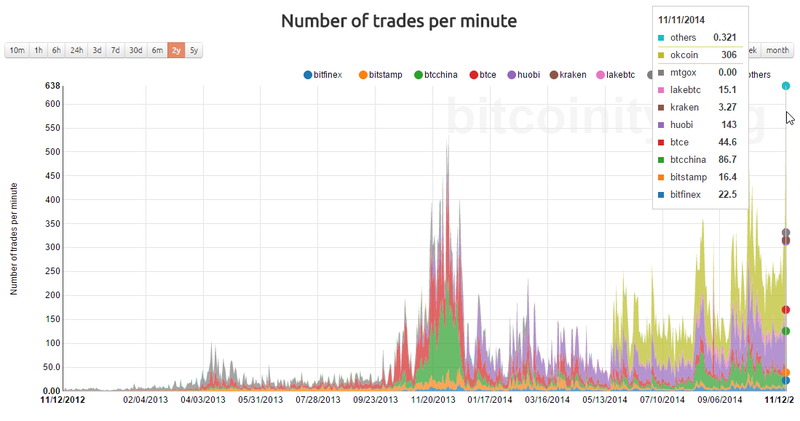 This accounts for 10% of the overall volume within a 15 minute period of trading”. Read on for this coming weeks forecast. A healthy mix of both TA and the fundamentals of any asset is an apt strategy for both short term and long term rewards. Well-known figures in the Bitcoin ecosystem – Barry Silbert announced a joint bid with Bitcoin Trust, while Venture Capitalist Tim Draper confirmed he would bid again in December. 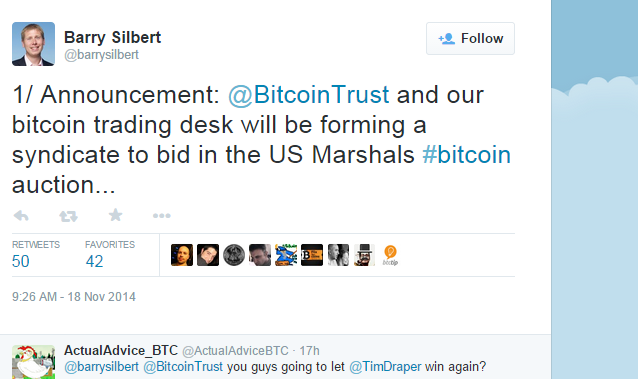 As always with Bitcoin, speculation simmers on the possible impact of this on the Bitcoin price. The last time an auction happened in June, prices spiked up. Watch for market anomalies these coming weeks. Institutional interest in Bitcoin is picking up from Hedge funds and the CFTC. OKCoin Chief Technical Officer Changpeng Zhao confirmed they had a new client on their platform with a market cap of 3 billion – a trading hedge fund. Meanwhile, Dan from Solid X partners spoke on a podcast show about the problem with Bitcoin in high finance and institutional markets. To remedy the gap, he touted Total Return Swaps as a ready-made institutional financial product package that fits right into their financial models and structures. You can have a listen here from 20 minutes. Finally, an announcement by BitPay for a massive Bitcoin Black Friday taking place on November 28th will take Bitcoin to a wider mainstream audience and possibly lure in more participants in the market. Last year’s event drew sales increase of 6,000%! 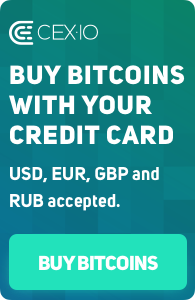 While using fiat convertible bitcoin purchases adds selling pressure on the price, mainstream awareness and adoption is great for the price mid-long term. The conflict on whether we are past a wave 5 bottom or not as per EW has reared its ugly head. The failure of the recent run-up to reach $ 500 levels likely implies a possible retest of $290 lows. The peak in price at $458 is seemingly a wave IV preluding a downtrend to retest $290 lows. 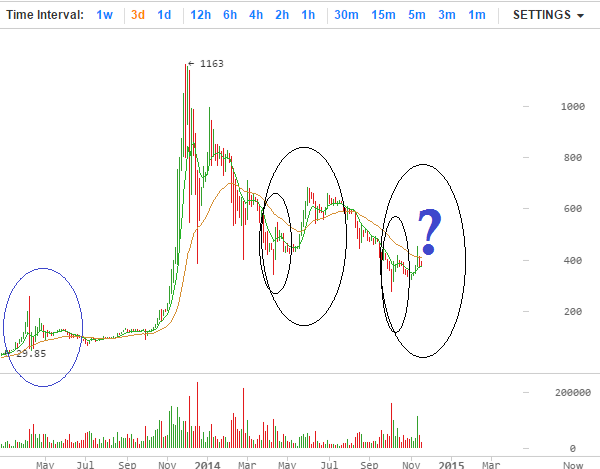 The elusive ‘bubble’ delays till after a retest of this bottom. The current prices are moving sideways and have dropped levels to retest $370 lows. A break to the upside is still possible. The current price action is an ambivalent state and until a clear signal is market, I remain bullish with short term bear expectations. 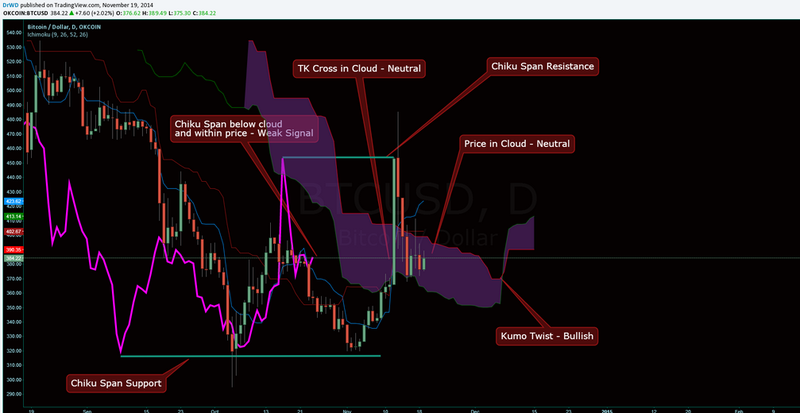 According to Ichimoku clouds, under used price trend indicators that are worth considering, the price has pierced into the cloud which is a signal of a trend reversal. This has been accompanied by significant volume surge on the daily; levels not seen in quite some time. A pullback is possible, but the trend is bullish. Despite the lower BTC prices which have some people feeling discouraged, our bottom is relatively higher than in past years and our next (if any) big bull rally will be based on a stronger foundation with an expansive infrastructure to flank it. While the volatility makes it unsuitable for BTC as a currency on daily occurrences, it makes for opportune day and swing trading opportunities. Do you want to earn on Bitcoin? Join CEX.IO!